For your most recent Walt Disney World trip, what type of lodging did you stay at? 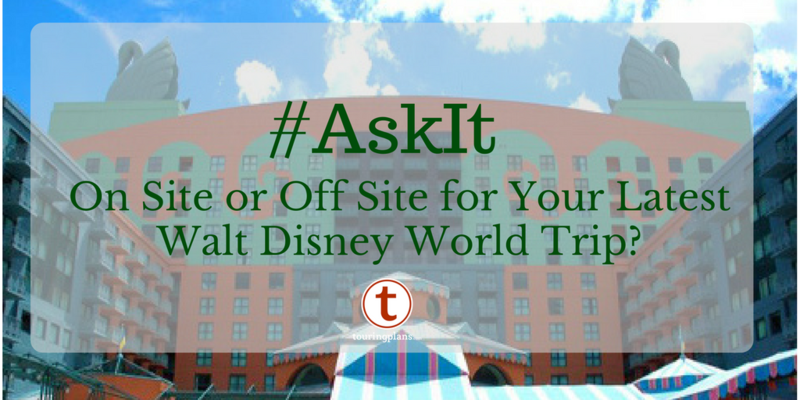 Although most people think of actual Disney hotels when they think about staying on property, there’s actually a few hotels on property that aren’t official Disney hotels, including the Swan and Dolphin hotels, the Four Seasons, and hotels in the Bonnet Creek area. The proximity to the parks is a huge plus (especially for the Swan and Dolphin), and I don’t think you’d find too many people who would argue about the quality of accommodates for the Four Seasons. Extending the bubble slightly, the hotels on Hotel Plaza Boulevard near Disney Springs often offer great deals, and now offer some on-property-style amenities, like Extra Magic Hours. If DVC is Disney’s Best Kept Secret, vacation homes may be Central Florida tourism’s best kept secret. In parts of Osceola County (on the south side of Walt Disney World property), you can find myriad vacation homes in different neighborhoods. There’s a variety of sites where you can compare features of homes and the neighborhoods you rent in, and many houses do have some Disney-themed touches. This can be a great way for a large party to save on accommodations and meals. Vacation homes are very popular with international tourists who come over to stay for several weeks at a time. For large groups who want to stay under one roof, a vacation home is a no-brainer. Without a doubt, you can find some great deals on rates by staying in an off-site hotel. In addition, off-site hotels offer easy access to restaurants at more normal prices. Some hotels also have some amazing amenities in their own right. (My favorite off-site hotel is the Gaylord Palms. The atrium views are very impressive, and the pool area was quite a bit of fun for our family, but also not as crowded as Disney pools tend to be.) If I had to choose a good mid-range off-site hotel, my personal favorites are the hotels at Flamingo Crossings. Yes, there’s not much out in that area right now in terms of restaurants (although a quick hop on 429 and you’re down at the 192 corridor), but access to Disney property through the Western Way entrance rarely has the traffic issues that other roads do. At the end of the day, it probably comes as no surprise that an overwhelming majority of readers of this blog choose to stay at a Disney hotel. Yes, Disney hotels cost more. In some cases, they lack amenities that you may enjoy at other hotels, such as a free breakfast. But there is something about being in the bubble that many people find is an intangible benefit worth the extra money. There’s also the convenience of knowing that once you arrive, you don’t have to drive or call for a ride-share vehicle until it is time to leave, because you can use Disney transportation to get around. Many people also note that, at the end of the day, if something is wrong, they feel confident that Disney will make it right. So there you have it, this week’s results. 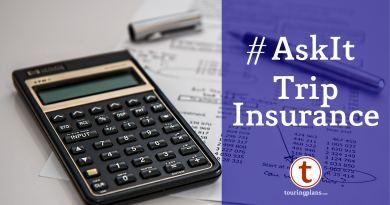 Next week’s AskIt is available on Twitter and on the blog here. In the meantime, what amenities would you like to see offered at Disney hotels that currently is not offered? Let us know in the comments. 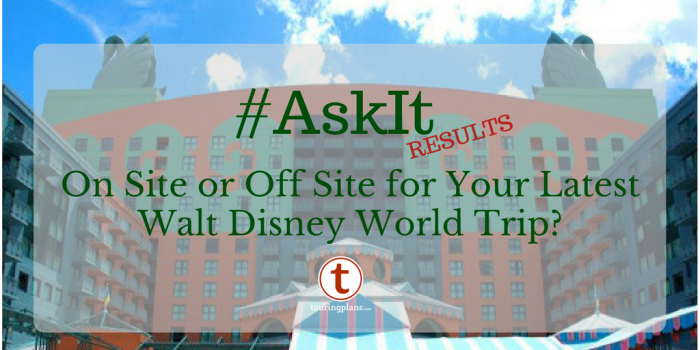 Ask It: On Site or Off Site for Walt Disney World? 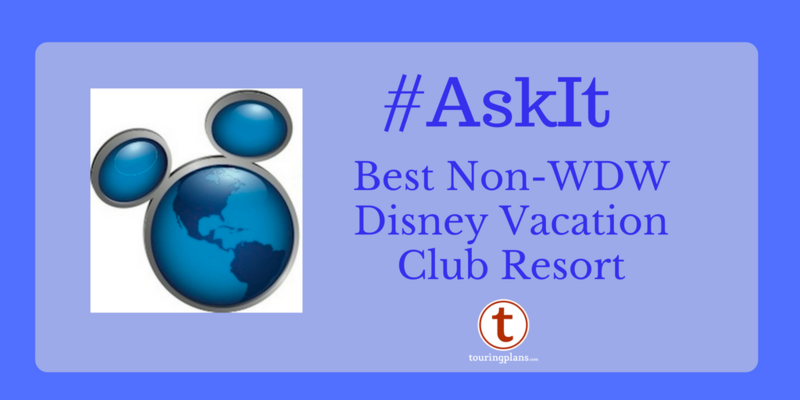 Ask It: Best Non-WDW Disney Vacation Club Resort? Interesting. I’d be curious to see the results if the question was not where you stayed on your last visit, but something more open ended to gather a wider-range estimate of use of off-site lodging. Like – have you ever? Would you again? Where for your next visit? Etc.